The celebration also marks the launch of www.pismodigitallifestyle.com where customers will soon be able to make online purchases. Pismo Retail and Sales Manager Rodel Sarino announced this new development. He also shared that plans for expansion are also on its way soon. 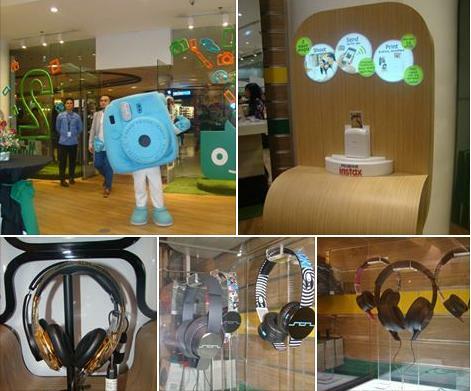 Pismo Digital Lifestyle is a concept store that carriers premium gadgets and accessories to suit your needs. New gadgets arrive daily and Pismo Digital gives you the first dibs on the latest electronic gadget, camera or new tools. It is an exclusive reseller of various top of the line brands such as Parrot speakers, Silverlit, Bowers and Wilkins speakers, Sweeth, Blue Aura, Jaybird, Atomic Floyd, plus a lot more for consumers with discriminating tastes. The Pismo team takes care in selecting and screening the branded items it carries according to its Product Manager, Patricia Lopez. Pismo Digital Lifestyle recognizes your need to test out a device's functionality when buying gadgets. The store has lounge wherein customers tinker, interact and play with their chosen tool or gadget. Buyers can check if the productivity tool or toy they are considering has all features they want. With informed decisions, one you can do away with buying gadgets blindly and ending up just wasting money on a gadget that slowly turns into an expensive paperweight. It carries DJI Phantom 2, which is considered to be the best drone for photography as it offer photographers and videographers more features than they could ever dream of. For 3D printing technology enthusiasts, Pismo Digital Lifestyle has this to offer. This Ultimaker 3D printer can communicate the look, feel, and style of product designs better. It can build conceptual or functional scale model objects in full color within hours. Your gaming, viewing and listening experience will never be the same with well-established brands that takes it notches higher! Aside from gadget protectors, Pismo Digital Lifestyle also sells a variety of bags that are stylish, lightweight, heavy-duty and even water-resistant ones for gadgets. Head off to Pismo Digital Lifestyle now and get a device you’re proud of! Do take advantage of Pismo Digital Lifestyle's ‪‎Anniversary‬ ‪‎Sale‬ until June 28th.